it’s an exciting day here at Consumer Physics. 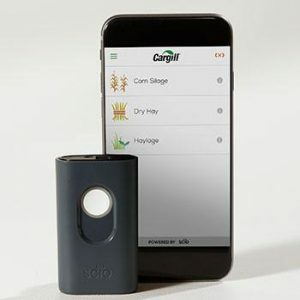 The reason is that Cargill, the world’s largest agri-food company and the largest privately held company in America, launched Reveal®, a SCiO based precision agriculture service for dairy farms. Reveal lets dairy farmers analyze the nutritional contents of their herd’s feed. 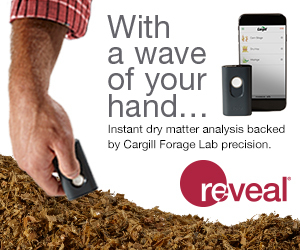 It currently analyzes dry matter in a variety of feed types, and as Cargill state in our joint press release “we see dry matter as only the beginning of what Reveal will offer to customers”. Dairy farming is much more precise than most people know. What cows eat, and how much of it, is directly related to the farm’s milk production. Dairy cows mostly eat silage, hay and fresh forage. These are organic materials that come in many shapes, forms, and water content. They can contain 30% dry matter (which means 70% water), or 50% dry matter, or pretty much anything else. It fluctuates with weather, time, and even within a single lot. Dairy cows require an optimal intake: not enough dry matter and you get less milk; too much of it and you’re disrupting the cow’s digestion – and again you get less milk, let alone wasting feed. If the feed is dry you’re probably overfeeding; if it’s wet you’re underfeeding. Either way you’re hurting productivity. The industry knows this and has tried to come up with solutions. The thing is, none of them are really great. Some are too cumbersome, so measuring frequently becomes impractical. Others, such as external lab testing, provide accurate analysis but results take many days or even weeks to arrive. And other solutions require equipment that’s too expensive for most farms, let alone that nobody wants to walk around the farm with a sensitive $7,000 device and risk dropping it into a pile of silage or dung. Farms that frequently analyze feed for dry matter significantly cut costs and increase productivity. But given the limited options, only the largest farms can afford to test feed often enough. And with most farms operating on rather low margins where feed makes up some 60% of overall expenses, any fluctuation in dry matter drastically impacts the farm’s profitability. The bottom line: most farms end up losing a lot of money because they have no good way to analyze dry matter in feed. This is where Reveal comes in. It combines the SCiO micro spectrometer with NIR calibrations created by Cargill. Anyone can carry it in their pocket, it’s operated from a simple and convenient mobile phone app, and it returns lab grade results within less than a minute. It can be used anywhere – in the field, grain bin, barn or silo. It enables optimized feeding, higher productivity and reduced feeding costs. So you can see why we’re so happy about this. First and foremost, because we’re delivering a solution that can help millions of farms all over the world. That’s always a great feeling. It’s also exciting to bring innovative and revolutionary solutions that make a real difference to so many people. Of course this is also exciting because Cargill, with its deep understanding of the market and its expertise in NIR, has selected SCiO above all other alternatives. It’s a real testament to the robustness and quality of our technology and to our ability to produce innovative business solutions. But to us this is just the beginning. SCiO has endless uses in feed, grains, corn, soybean, milk, meat and much more. It can be used in the field, at the grain elevator, or in the processing plant. It can be used to assess quality, optimize harvest time, validate incoming materials and to streamline processes in the plant. Our vision is a spectrometer in the hands of everyone, used to analyze materials anytime, anywhere. And it’s rapidly taking shape. So stay tuned for more exciting news in the near future. A SCiO used to analyze materials by anyone, anytime, anywhere. And it’s rapidly taking shape. So stay tuned for more exciting news in the near future. To read the Reveal press release go here, and this is the Reveal page on Cargill’s website.